There is a lot to discover here for the casual Superman fan. Most intriguing is the notion that back then the hero literally leapt "over tall buildings in a single bound". He did not fly. It was the Fleischer brothers, Max and Dave, that encouraged the comic book publishers to change his power to that of flight, a much more fluid action onscreen than the constant leaping. Equally surprising to those not accustomed to the political incorrectness of the time is Superman's use in racially insensitive cartoons like "Jungle Drums" or the wartime propaganda short, "Japoteurs." And then there are the interesting bits of trivia you find out from watching the fascinating extra included on disc 2, First Flight: The Fleischer Superman Series, where it is explained that the uncredited voice of Superman, Bud Collyer, was already well-known to fans as his voice on the Superman radio show. A fascinating look at an early piece of Americana, with great art and misguided notions still intact, Max Fleischer's Superman is a great DVD for any fan of classic cinema. In other news from Warner Home Video, the Warner Archive discussed in an earlier post has extended their library with another 15 titles which you can find here. A cool supplement to this fantastic collection are free podcasts of some early radio theater performances associated with some of these titles (Chained, Abe Lincoln in Illinois, and more). You can download them here or on iTunes. The most interesting bit of news to arrive at my doorstep today again concerns Warner. It demonstrates their thoughtfulness when it comes to its fans, a welcome change in these tough economic times, and a great bit of marketing. Starting today, Warner offers a program called Red2Blu. For all you consumers who purchased Warner HD-DVDs and felt betrayed by the market's choice of Blu-ray instead, you are going to be happy when you hear this. Warner will upgrade your HD-DVDs to Blu-ray for only the cost of shipping if you mail them the original HD-DVD cover art. More information can be found here. What a great way to win the loyalty and support of new Blu-ray enthusiasts. Can't wait to see what new initiatives Warner comes out with further down the road. Thanks for highlighting this release, Tony. 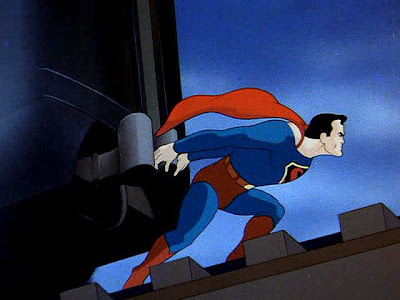 I saw the Fleischer Superman shorts for the first time last year, and most of them are fun and entertaining. Are you of the mind (as I am) that the quality of the shorts decreases after Paramount took over and ousted Dave and Max? I even think the later Fleischer cartoons aren't quite as good as the first five or so, but I do enjoy the Americana of it all. Thanks too for the fact about Superman's flight — that will officially be my "learn something new every day" factoid. I absolutely agree about the decline in quality. But they were facing financial troubles at the time, so it was understandable. Still... the decline in quality doesn't affect how much better these are than many of the traditionally drawn animateds that pass for cartoons today.